I certainly don’t profess to be an expert when it comes to crowd funding. I’ve been lucky enough to work on a campaign in The Fitzroy that came off through hard work and the public’s connection with the concept. Because of that, we’ve been flattered by so many people asking advice on their own crowd funding campaigns and what they can do to make them a success. I don’t like to tell people how to run their campaigns, because like I say I’m no expert, and there are a variety of ways to run a successful campaign depending on the type of film you’re making. 1. Wrong project for crowd funding. Can you generate your target budget? If you’re planning on raising millions of dollars, crowd funding is unlikely to be the platform for you. Of 8,918 successful film campaigns on Kickstarter, 5,579 (62%) of those raised between $1,000-$9,999, so if you’re going to target more than that you’d better have a very good campaign. Will fans get behind your project and want to see it made? People are unlikely to back your project if it’s just another run of the mill zombie or gangster movie. It needs to have something a bit different like ‘Underwater Realm’ with its underwater filmmaking, have an established fan base like ‘Video Game High School’ with its existing web series or a very established name attached like ‘Charlie Kaufman’s Anomalisa’. Do you have the time and energy? Campaigns take a lot of time and commitment. If you don’t have that available during the time it’s live, I’d say don’t bother starting one in the first place. 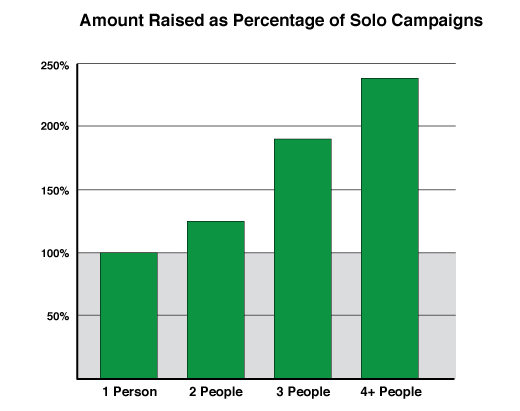 Don't do it on your own, Indiegogo research shows that 80% more money is raised with a team than by yourself. The whole team need to be able to promote the campaign, it won’t promote itself. I personally didn’t sleep well during The Fitzroy campaign and worked harder than I have on most film productions. Are you using the right crowd funding platform? Kickstarter, Indiegogo, Sponsor Me are a few of a number of the growing platforms for crowd funding. Discussing the correct platform is a whole other blog in itself, though there are various reasons as to why you would choose each platform (cost, success rate, audience etc). Do your research and figure out what is best for you. N.B. Indiegogo was previously known as the best place for film, but Kickstarter had a better than expected year in 2012 with 3,891 successful projects raising $57,951,876. It may even involve tailoring your idea to work for crowd funding. For example not many people are aware, that The Fitzroy was not originally based on a submarine but instead on a just a normal run down hotel. I believe that the change to a submarine was one of the key reasons we succeeded on Kickstarter. The idea was different and original, which meant the public engaged with it. This to me is the most obvious necessity for a film crowd funding project – in fact any crowd funding project. The reason why its so important for film is because you’re making a film - if you can’t make a short video to support your project how can people trust that you’re able to make a whole film? It does surprise me the number of people who don’t put a video on their campaign. Shot in one take, you get to see the personality of all the cast and crew involved and what sort of film they want to make. I also love the metaphor at the end of everyone getting in bed together to help get a film made. I also think length is very important. Generally, people have short attention spans and particularly now with a wealth of video content online. If you’re going to make a video much longer than 3-4 minutes, you need a really good reason for it. Certainly shouldn’t be the director rabbiting on about how this is their dream film and its going to be amazing. Studies show that the majority of audiences will drop off by 60 seconds, so I would try to grab their attention at the beginning and get straight to the point. The graphs below show how audiences of online videos drop off. Percentage of average audience lost over the duration of a online video. Over 50% are lost by 60 seconds in. NOTE: Incidentally, The Fitzroy’s campaign video had a play completion of 39.48% from a total view count of 15,186 views, which we were pretty happy with for a 3 minute video. Kickstarter have a pretty useful guide on Making your video. 3. Rewards not thought through. Rewards are the most powerful tool any crowd funding campaign has in my opinion and I see a lot of great ideas not work because the rewards have been poorly considered. I don’t know about you, but there have been projects I really liked and not backed because I didn’t like the rewards or didn’t agree with the price they were set at. $25 is the most popular pledge level for almost all campaign types on Kickstarter, so have something around this level that people will want like the HD download of the film. An easy mistake people make is to set the first reward high at round $50-100 because they think that the lower amounts aren’t going to get them to that high target - that’s completely wrong. “Every penny counts” is a cliché, but a true one when it comes to crowd funding. Not only is that more money in the bank, but it’s another supporter of your film who will tell their friends about your project. Some people can’t afford more than a few dollars, so you need to give them a way to support your film with low level rewards even if its just in return for a thanks on social media. Everyone should have a reward level that is right for what they can afford and then a reward that is slightly more expensive that may potentially entice them into going for it. MAN-CHILD on Kickstarter is a very good example of tiering of rewards. The rewards should also be interesting where possible. Think about what merchandise rewards you can make unique to your film that no one else will have, something people can’t buy anywhere else. I also see campaigns that have only a few rewards, which doesn’t allow for small pledge increments and a range of interesting rewards. Personally, I think around 10-14 rewards is about right, as long as they aren’t just for the sake of it. Eight really good rewards priced right could also work, any less than that and you may struggle to engage. We probably had slightly too many on The Fitzroy in the end, but I think that all our rewards were interesting and if we did have too many it was because we were trying to actively engage different audiences. Where possible plan to hold back rewards to later in the campaign or try to come up with rewards that your fans want. For example, we announced the Gas Mask prop rewards half way through our campaign and it wasn’t even something we considered at the start. Then the fans really engaged with them and not only did they pledge for them but it became a talking point across social media. If you reveal all your rewards in the initial release you’re losing potential buzz and reasons to bring people back to the campaign, also later reveals have the additional bonus of upselling to existing backers. Everyone enjoys a story, and the best way you have of turning your crowd funding campaign into a narrative is to keep updating your fans. Many campaigns fail to update until right at the end of the campaign when they are getting desperate, or post no updates at all. It's essential to maintain a running dialogue throughout a campaign in the form of project updates, newsletters, and social media outreach. Thanking contributors often (they are the most importnat people to your campaign) and keep them up to date of new developments worth passing along. Outreach should occur on a daily basis, though we found the most powerful tool was to post updates through the crowd funding platform. Post regular updates on your page about what you’re doing, news and changes to the campaign. This has the added bonus of keeping your supporters engaged which in turn makes them more likely to talk about and share your campaign. This is also where holding back a reward comes in. On The Fitzroy, we staggered the release of poster rewards. The funding had to reach a certain target before we revealed a new one. Not only did this build up buzz to smaller targets, also it gave us a good reason to post an update when we hit these targets because we could reveal a new poster design. You can also make a new video explaining something about the film, or an interview with a key member of the cast or crew. If you have news of an exciting cast member or are named IndieWire project of the day, update people about it. Recently successful campaign ‘Bid for My Life’ on Indiegogo is a great example of regular engaging updates. James Hamer-Morton did 26 updates on Indiegogo, all of which had something interesting to say and usually had a video based on user engagement. Having exciting updates has the added bonus of having something for you to talk about across all your social media channels to try and engage fans. As constantly just asking fans for money on Twitter and Facebook will soon get tiresome and have them turning their back on you. Also, your crowd funding platform of choice are more likely to support and feature the project on home page and newsletters if interesting updates are posted across the campaign. Like us, they want to see and tell interesting stories too. On the flip side don’t just update for the sake of it. I see this regularly with campaigns getting desperate towards the end, and people not sure of how to engage so update as a last resort. One particular campaign I backed, recently did three updates in 24 hours towards the end and there wasn’t anything new or interesting in any of those updates. I considered cancelling my pledge just to stop getting the pointless messages! Audiences hate you talking at them if you have nothing to say, it’s a real turn off. A classic mistake a lot of campaigns make, is to have their campaign as long as possible thinking the more time its live, the more money they’ll be able to get. Research has shown the optimal length for a crowd funding campaign is around 30-40 days. Though I’d suggest 30 days is probably the ideal to aim for. Too long and your fans and potential funders lose interest. As already mentioned its hard work running a crowd funding campaign, so to maintain fan engagement for anything like 60 days is virtually impossible. The majority of campaigns flat line in the middle period, peaking at the start and in the last 48-72 hours. A campaign should not be used to gather incremental on going pledges for your project. It’s more effective to build pledging rapidly as fan base is generated with a sense of urgency created, “pledge before its too late”. If a campaign is too long it never creates that urgency, as fans feel no pressure to pledge before the campaign runs out. I’ll hold my hands up and say we even got this wrong to a degree on The Fitzroy. We planned a 45-day campaign and only realized just before launching, a 30-day campaign may have been better. Though we had so much planned across the 45 days we couldn’t easily change the duration and felt it a risk worth taking. We’ll never know if having a 30-day campaign would have meant the campaign would still have been a success, but if I were to do one again I would certainly plan for a 30-day campaign. To stress all the above is based on my own personal opinion, though any statistics just are based on fact. In the coming weeks we a planning a "How we did it" for our own 'The Fitzroy' campaign. If this is of interest, sign up for the newsletter at www.thefitzroy.com. If any of this information provokes any questions, please do get in touch and if you were interested in discussing your campaign I’d love to hear from you.